Take advantage of recreation opportunities including an indoor pool and a fitness center. Additional amenities at this aparthotel include complimentary wireless Internet access, gift shops/newsstands, and barbecue grills. Featured amenities include express check-in, express check-out, and complimentary newspapers in the lobby. Planning an event in Dublin? This hotel has facilities measuring 1608 square feet (149 square meters), including a meeting room. Free self parking is available onsite. Take advantage of recreational opportunities offered, including an indoor pool, an outdoor tennis court, and a 24-hour fitness center. This aparthotel also features complimentary wireless Internet access, a fireplace in the lobby, and barbecue grills. Make yourself at home in one of the 106 air-conditioned rooms featuring kitchens with full-sized refrigerators/freezers and stovetops. 36-inch LCD televisions with cable programming provide entertainment, while complimentary wireless Internet access keeps you connected. Conveniences include phones, as well as laptop-compatible safes and desks. Featuring up-to-date guest rooms, new fiber-optic connectivity and a complimentary area shuttle, Crowne Plaza® Columbus - Dublin, Ohio, is the perfect base for work or leisure trips. For business travelers, Crowne Plaza is close to such companies as OCLC, Ashland, IBM, Honda, Cardinal Health and Verizon, and is home to the best event space in Dublin. With 13,000 square feet of space, over 12 updated rooms, and outdoor courtyard perfect for weddings, meetings, and other functions of any size. Our business center is open 24 hours a day to ensure that you’re well connected and prepared for anything. While in Dublin, explore our city’s rich Irish history and attractions. As a hotel near the Mall at Tuttle Crossing, Crowne Plaza Dublin, Ohio makes it easy to shop at over 120 of your favorite stores. 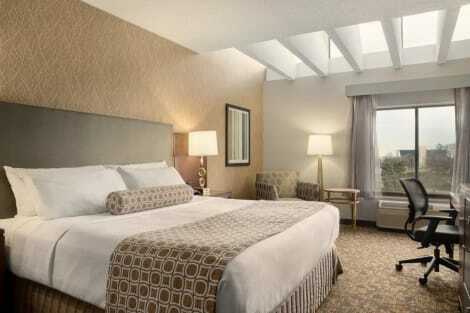 We are also the clear standout among hotels near The Ohio State University. Stay here for convenient access to sporting events, graduations and more. Looking for hotels near the Columbus Zoo and Aquarium? Crowne Plaza places you minutes away from one of the country’s best zoos, made famous by Jack Hanna. At the hotel, relax by the indoor pool, dine at Dublin Metro Grill, order room service or enjoy happy hour specials at the bar. In your all-new guest room, the Crowne Plaza Sleep Advantage® program’s amenities, such as an aromatherapy kit, will ensure that you have a restful night. With a stay at Hilton Garden Inn Columbus/Dublin in Dublin, you'll be within a 15-minute drive of Columbus Zoo and Aquarium and Indian Run Falls Park. This hotel is 15.2 mi (24.5 km) from Ohio State University and 16.4 mi (26.4 km) from COSI.